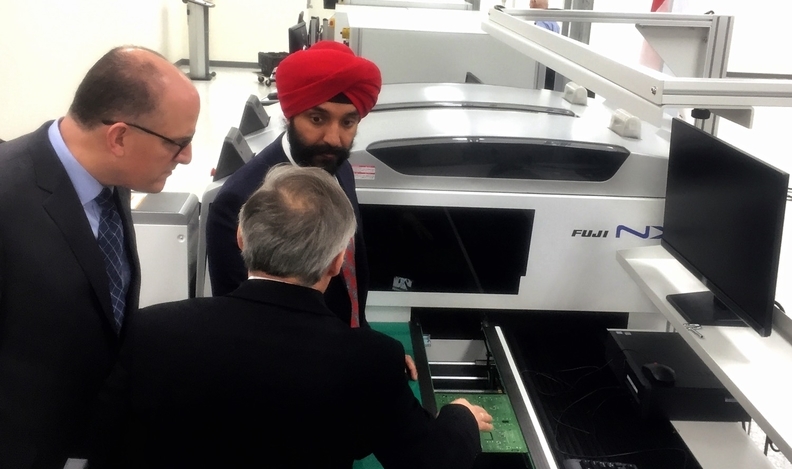 Canadian Minister or Economic Development Navdeep Bains, top, tours supplier APAG's Windsor, Ont., plant after announcing $4 million in funding for the company. Despite having all federal options to save General Motors’ assembly plant in Oshawa, Ont. on the table, Canada’s economic development minister said Monday that a meeting with the automaker’s CEO in Detroit didn't change the planned outcome of the factory. Navdeep Bains, speaking in Windsor, Ont., before the meeting said the federal government “stands shoulder to shoulder” with the autoworkers and did not rule out federal financial assistance as a way to keep General Motors operating its assembly plant northeast of Toronto. But after meeting with Mary Barra, he didn't sound convinced the automaker would ever reverse course. GM said in November it would no longer allot the plant product after 2019. The automaker said it will stop the truck shuttle program that sees it ship unfinished, outgoing models of the GMC Sierra and Chevrolet Silverado to Oshawa from a plant in Indiana. The automaker also said it will stop building the Chevy Impala and Cadillac XTS, both of which are assembled in Oshawa. Bains said APAG, a Swiss company that mainly supplies BMW, Volkswagen, Audi and Porsche, would get $4 million to help establish a North American headquarters and a research and development centre in Windsor. The electronic control units that it will be made in Windsor will supply Volkwagen’s assembly plant in Spartanburg, S.C. The Windsor facility will employ about 150 people. “We have a government that’s willing to step up and be a partner,” he said. “This is about GM having a long-term future in Oshawa. This is about making sure we secure mandates for GM in Oshawa. Bains’ Ontario government counterpart, Todd Smith, sounded a different tone. Smith, the minister of economic development, job creation and trade, said there was “nothing we could do” to change GM’s mind on Oshawa. Smith said the Ontario government was willing to assist GM financially to keep the plant open, but the automaker rejected the offer. Following his meetings with Bains, Ford and Smith, Dias said it appeared both governments were beginning to take a “different tact” and that he was confident the premier would reverse course and fight for the Oshawa plant’s future. Like Smith, Ford has repeatedly said there is nothing the provincial government could do to keep Oshawa alive. But Ford appeared to stay the course. Smith said the Ontario government’s focus would be on helping Oshawa workers find new jobs and helping GM to grow the rest of its Canadian operations. “We need… the Unifor folks to engage with their employees so that we could then help with our training colleges and universities ministry to get them the help that they need and the potential retraining that they need,” Smith said. Speaking with Automotive News Canada, Dias said Unifor is solely focused on preventing Oshawa’s closure, though the union would not stop its members from pursuing retraining. GM said it would end the truck shuttle program that sees it ship unfinished, outgoing models of the GMC Sierra and Chevrolet Silverado to Oshawa from a plant in Indiana. The automaker also said it will stop building the Chevy Impala and Cadillac XTS, both of which are assembled in Oshawa. The automaker also plans to shut down four plants in the U.S. as the company moves to reduce costs and focus on electric and autonomous vehicles.